I’d be remiss in my duties as an anime club webmaster and general angmo otaku if I didn’t take this opportunity to wish Hatsune Miku a happy birthday! 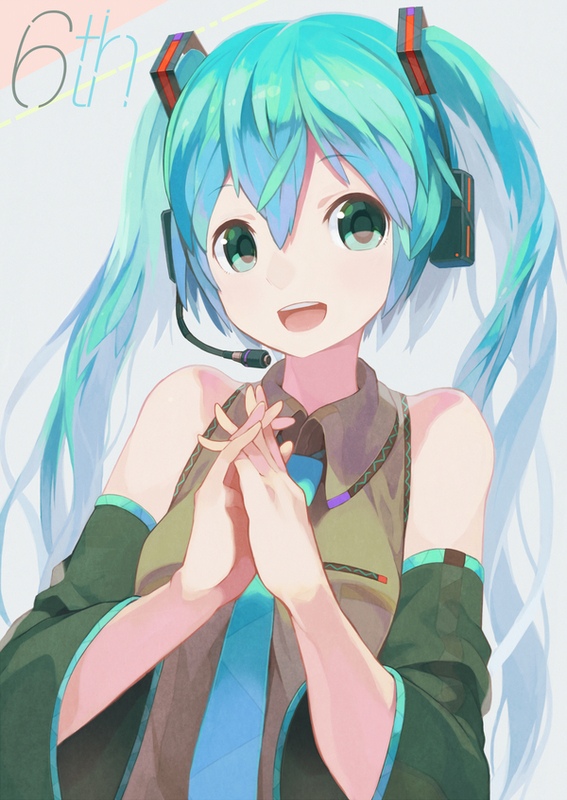 Having started her career as the lead voice for the Vocaloid software, in many ways Miku has become the de facto mascot for anime and otaku culture in general. Her voice is instantly recognisable. Every event (not least SMASH!) always has its fair share of Mikus; even some rather attractive men take up the cause. (I rather think Clara would do a ridiculously cute Miku cosplay, but then it wouldn’t be fair to anyone else attempting it)! Anyway, where was I? Imageboards list tens of thousands of fanart images in all manner of styles. Her music videos have her in more costumes than I own myself. I’d wager she has more anime figures than anyone else. She’s in posters, on car decals, has had cameos in anime and manga and on weird people’s weblogs or blogs or whatever they’re calling them. She’s even singing in English now! The only hard part was deciding which of the hundreds of Pixiv birthday images to include! Among all the classic, Append, Love is War and GSR images, I thought this one by tomioka2 was the nicest. Happy Birthday Miku; may your taking over the world continue in earnest!